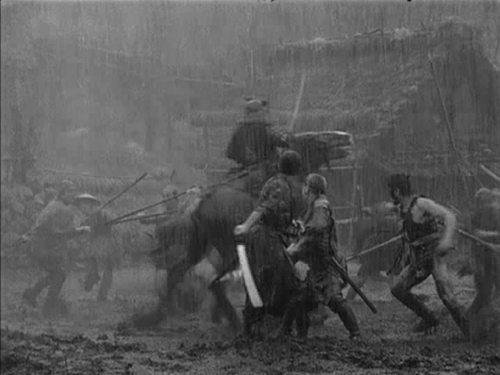 Many consider “Seven Samurai” a landmark in filmmaking. The film coined the term “samurai” in many languages. Gradual plot element buildup, main characters as a team, realistic battle scenes, slow-motion as a punctuation in violence, multiple telephoto lens cameras to capture action simultaneously, montage to introduce main characters, etc. such many innovative elements are condensed in one, big narrative. Many call this masterpiece, others simply hate it. Some says you don’t feel the length of the film, others say this is criminally long. I would like to point out that this film very much falls into the traditional realm of Jidaigeki (Period Films) as a tale of class conflict and disillusioned elites. And the Kurosawa’s innovation lies in the re-reading of this Jidaigeki in the context of postwar Japan. Kanbei’s last line, “The farmers have won. Not us.” is one of the most often quoted among Kurosawa’s films. Or maybe one of the most memorable lines in Japanese cinema along with Ozu’s “Life is disappointing” in “Tokyo Story”. While Ozu’s line contemplates on condition of our lives in general, Kanbei’s line redefined the life’s achievement, or art of winning and losing. From the very beginning of the film, we are with the farmers. They are meek, helpless and poor. As the characters we are going to ride along, they are the least interesting and anti-heroic. For we are conditioned to anticipate some heroic figure to spice up the glamour of the story, it is natural for us to find these farmers somewhat trivial. That’s where Kanbei comes in. The episode of Kanbei’s rescue of a mother and a baby is a miniature of what follows in the film. Begged to save a mother and a baby in danger, Kanbei uses wisdom and his swordsmanship to solve the crime. This episode is so impressive that we know we have our hero in this very humble man. But are we to call this episode, Kanbei’s victory? Who won in this battle? In another episode, Kyuzo, the unparalleled swordsman, was forced to fight with an adamant challenger using real swords, only to finish him off in one stroke. In this episode, we have a winner and a loser. But this win is bitter and not even sought after. It’s only a win over idiocy. In samurai’s battle, the winning is the ultimate goal. Loss means death. Even when you are using wooden or bamboo swords, it is assumed you are fighting a real kill or to-be-killed battle. Since samurais serving a master have more grandeur vision, such as to build a nation, their motivation to win can be justified in that context. Martial institution of the medieval society in “Seven Samurais” is based on this premise. A samurai needs a master to serve, and his skills of killing are required to fulfill his duty. But how about wandering samurais with no master? To them, loss still means death, but how about winning? As Kanbei’s and Kyuzo’s episodes suggest, winning does not seem to amount to anything but aimlessness of their presence. In fact, to them, winning is still somber reminder that they could have been elites in the society, but nothing but failures. To understand the premise of this film, you need to know there are three different classes of Samurai depicted in this film. A ronin is a samurai with no master. During this era, because many warlords were constantly in conflict, many warriors easily lost his masters. All six samurais (except Kikuchiyo) are ronins. A group of nobushi, bandits, is the enemy in the story. They were also masterless, but formed a group to terrorize the neighboring area. They were the soldiers of the defeated, and on the run. They were targets of manhunt by locals. In this film, no Ochimusha is shown but the villagers had the stash of weapons they had ripped off from them. This suggests the villagers brutally killed Ochimushas in many occasions. All three groups of samurais have one thing in common; they are without masters. Of course the six samurais had not been masterless always and Kanbei suggests he had fought for masters of losing side. This indicates that he might have been an “Ochimusha” chased by a band of angry villagers. This is why six samurais are upset when Kikuchiyo uncovers the stash of weapons the villagers had hidden. They have more common with those who had left the weapons (and had been killed) than with the villagers. Also, these six samurais have more common with Nobushi, their enemy as well. Otherwise, they would not be able to predict the strategy of the bandits. They know where, when and how the bandits would strike, precisely because they would do the same, if they were bandits. It’s knowledge the villagers do not have. I have been using six instead of seven as a number of samurais. This is because Kikuchiyo is not exactly a samurai, but a lone wolf who actually ran away from a farming village. Due to this background, he is the only person who could bridge the two different worlds of samurais and farmers. Many of the Kikuchiyo episodes tell us how rigid samurai-farmer relationships were. His revelation that farmer’s were actually insidious and scheming is not only shocking but creepy to the other six. But this revelation was essential for them to understand farmer’s underlying strong will to avenge the intruders. This is the fundamental of this film. Six samurais share little with the people they protect, while they have much more common with the enemy. The tension created by this contradiction hangs on balance throughout until the final battle scene. Kikuchiyo is central to balancing this tension. One of the innovations found in this film is the realistic depiction of the battle scene. Up until this film, Japanese cinema had been heavily influenced by the theatrical presentation of Samurai epics, in which the sword plays had been choreographed into a series of efficient, suave movements. Especially many earlier Jidaigeki stars, such as Chiezo Kataoka, Denjiro Okochi, Tsumasaburo Bando and Kanjuro Arashi, were noted for swift movements and dramatic actions during battle scenes. In addition, large part of B-action Jidaigeki films being the weekly entertainment for kids, the story tends to be outrageous, in which the hero defeats tens of enemies in a single action. They were simply complete fantasies. This film liberated the Jidaigeki from this traditional mold. Notable attempt to make Jidaigeki something appreciable to mature public tended to be more “artistic” with less actions; “Chushingura” by Kenji Mizoguchi was filled with perfectly coordinated camera movements and gorgeous sets; something film affectionados could drool over but general public expecting the simple revenge story would find boring. In this regard, “Seven Samurai” is a pure action film. How do you make an action film realistic? Many has pointed out that the battles in heavy rain and mud made this sequence realistic, while others attributed the details of props, war gears, weapons and tactics to the factors. However, the most crucial factor is the reality of the warriors. They run and run and run. Their swords cut empty air most of the time. They stumble, and fear the enemy’s blades and bullets. They are not superheroes. This treatment of Jidaigeki is also coincide with maturity of audience. At the time of the film’s release, Japanese cinema had essentially 40 years of commercial history. Many mature audience at the time had experienced the golden age of Jidaigeki actions during their childhood. Because of their appreciation of films directed by Hiroshi Inagaki, Daisuke Ito, Masahiro Makino and others in prewar period, another “fairly good” Jidaigeki film would not please them. Kurosawa had been a part of that history. He knew all the tricks of the trade and he wanted to top it. At the same time, this film was one of the first major Jidaigekis in many years. During the Occupation (1945 – 1952), Jidaigeki was practically prohibited, because U.S. feared it might glorify feudal ideas of sacrifice and royalty. As a result, this 1954 film became the first Samurai film to feature extensive battle scenes in many years. As the audience had experienced the reality of the war, choreographed fighting scene might look too fantastic and fake. Then, Kurosawa must have felt challenged to reproduce the feel of danger and exhaustion of soldiers on celluloid as “real” as possible. After the battle, we see the farmers rejoicing their victory and regained peace, while the surviving samurais contemplate on the battle. The quotation above is the only lines spoken during this last chapter, while we read the story of souls separating from each other mostly by a series of exchange of gazes. Kanbei observes at festive rice planting by the villagers and then, the shadows of graves. Shichijiroji and Katsusiro follow Kanbei’s line of thoughts as they share the sense of irrevocable loss. Economical, efficient and effective way of storytelling as it is, it is also the most eloquent. 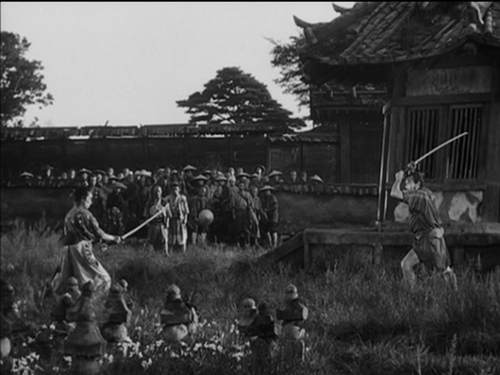 This is the reminiscent of the earlier scene, in which Kyuzo is challenged by another Ronin in duel. Here, Kanbei observes two samurais intensely and the series of his gazes form the story parallel to the actual action in the film. He utters, “What a waste (無益だ/Mueki-da)”. “Mueki” means wasteful or meaningless, frequently coupled with the word Sessho (殺生), the killing. Indeed, this duel ends with a wasteful killing. Kanbei confesses, he had a dream of being a warlord, but now he got gray hair and his parents and friends were all dead. This observation resonated with the other samurais. And in this sense, they are all losers. They had done numerous wasteful killings in losing battles, only to end up as masterless wanderers. This somber defeatism is again amplified in the end. Historically, Jidaigekis heavily rely on this multiple layers of ethics and heroism. Many ends with the defeat of the hero as he realizes the killings do not solve any problem. It is not that he is fighting against the evil, but against the dislocation in the society or human nature. In prewar period, being defeated but with clear conscience had been the trademark of a hero. In Chushingura, one of the most typical Jidaigekis, 47 ronins are defeated in the end (all ordered to do harakiri by the authority), but this is after they achieved the revenge nonetheless. In Kurosawa’s film, this authority is absent. But still, they feel defeated after they achieved what they were set out to achieve. You are still a loser, not because somebody tells you are, but because you are not building your future on it. Some say this film refer to the nature of controversial Self Defence Force of Japan instituted in the previous year. Maybe. But I believe this film is as relevant now as ever. Terror is rampant everywhere in many different forms, while most of us fail to envision the resolution. Some of us may anticipate heroes to protect us, yes, innocent but insidious ‘us’. Heroes with superior discipline and skills, but do they exist? Or are we just imagining them?